If your idea of a dream Friday night in involves kicking back with your favourite takeaway food, a good film and a few winning rounds of bingo, then you will love Coral Bingo’s latest promotion. This tasty offer is serving up £10 of Hungry House vouchers to several lucky players and that’s not all it has to offer. Keep on reading to find out more. Five winners will be picked each Friday night during the promotion to win the £10 Hungry House voucher. This voucher can be redeemed at the Hungry House site and used to order food from any of your local eateries. In addition to this, every single player who earns at least one prize draw entry for the promotion (we’ll explain how exactly to do that in just a moment) will be treated to one hour of free bingo for the Friday night that the prize draw is held. The free bingo session will be taking place in the Coral Bingo’s Garland Room between 9pm and 10pm. The session will have a £500 prize pool up for grabs. 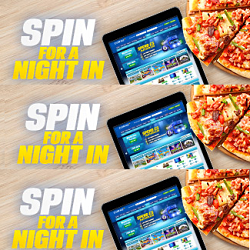 To qualify for the Spin for a Night In promotion, you must sign in to your Coral Bingo account- or sign up for one if you’re not a registered member yet- and click ‘Opt In’. Once you’ve opted into the offer, every £10 that you spend on Coral Bingo’s many slot games during the promotional period 31st December- 26th January, will earn you one prize draw entry. There is no minimum or maximum amount of times each player can enter into the prize draw. This means that if you’re an avid slot fan you could play as much as you like for a much higher chance of winning and if you’d rather enter just once you will still be in with a shot and receive an hour of free bingo. This offer is open to all Coral Bingo customers, whether they are existing members or have just signed up to claim this offer. The promotional period runs from December 31st to January 27th. All players must opt into the offer once during these dates and wager the required amount of money in order to be entered into the prize draw. The five winners each week will be contacted by email on the Friday of the prize draw and given a code. This code can be entered into the Hungry House website and is good for £10. For this reason, it is essential that the website has your correct and current contact details on file. Please note that this Hungry House voucher cannot be exchanged for cash or any other alternative.